Hanna Norman’s first career brace propelled the North Dakota State women’s soccer team to the team’s first win of the season last Saturday against Utah Valley. Norman provided the offense that had been missing for the Bison, who had scored just once in seven games to open the season. The opener broke the Bison’s way despite the Wolverines getting the early chances. Utah Valley had already tested Bison goalkeeper Monica Polgar on three occasions while having several shots go high. 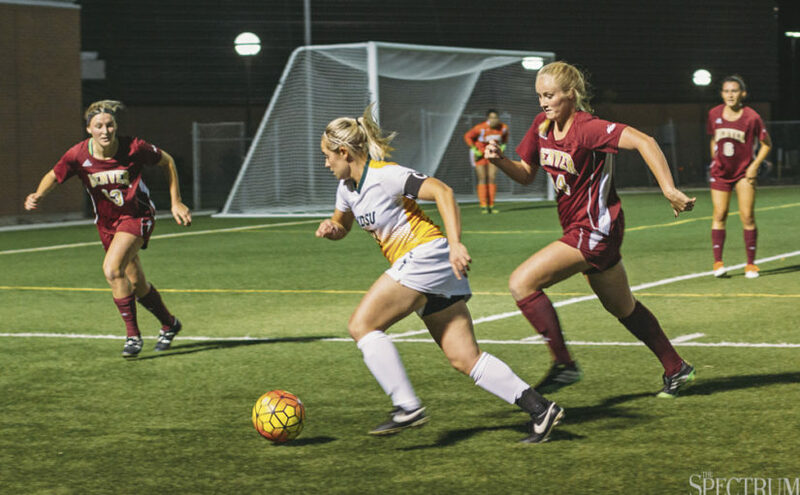 The 35th minute was the turning point for the Bison. A foul at midfield by the Wolverines allowed the Bison to get the defenders forward for the free kick. Freshman Marian Taiwo won the header to flick the ball behind the Wolverine’s backline. Norman latched onto the flick and coolly finished with her left foot. Amber Tripp called Polgar into action again late in the half, but the sophomore keeper handled the shot cleanly. The Bison went into the break with their first lead of the season despite being outshot 6-3. NDSU almost doubled the lead in spectacular fashion in the second half. Roxy Roemer launched an in-swinging corner that seemed to be curling into the far post. Wolverine goalkeeper Brooklyn Nielsen pawed the olimpico attempt away to keep the score 1-0. The Wolverines continued to pour on the pressure, but the Bison backline stood firm. Three attempts to break the Bison defense ended in offside calls against Utah Valley. On the occasions where the Wolverines got pressure, Polgar was up to the task. Balls in the box were comfortably dealt with by the sophomore, killing any attack the Wolverines could muster. With the final whistle 11 minutes away, Norman wrapped up the win for the Bison. Utah Valley failed to fully clear a Bison corner, and the ball came back into the box. Freshman Danielle Algera, caught by surprise by a slight touch from the keeper, knocked the ball to Norman who finished from six yards out. The Wolverines looked around for the offside flag to be raised, but the official kept the flag down to give the Bison the 2-0 lead. Utah Valley forced Polgar into one final save to preserve the clean sheet. The save secured the first shutout for the Bison and gave Polgar a career high nine saves. The Bison have one more pre-conference match before the Summit League schedule kicks in. NDSU hosts Jamestown at 7 p.m. Saturday at Dacotah Field. The Summit League opener will be Dacotah Field five days later against South Dakota.